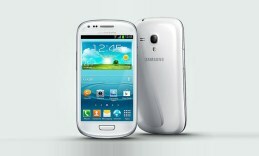 ctober 11th was the date Samsung chose for the global launch of the much rumored Samsung Galaxy S3 Mini. But no more rumors – in today’s video review you will meet the smaller and younger brother of the S family, and not only meet it, you will get to know every single detail about it. As you probably have already guessed from the name that it is Smsung’s much more compact version of the flagman you already know very well the Galaxy S3. As it is the S3’s successor you will probably want to know what is the difference between the S3 and the S3 Mini version. First of all come the more compact dimensions of 121.6mm height, 63mm width and less than a centimeter thickness. It is addressed to those consumers who were not so happy with the S3 much bigger size. On the other hand, technically speaking, the Galaxy 3 Mini is closest to the Galaxy S2. The design is a typical one for the S family – the case is made of the flexible glossy polycarbonate which make the smartphone look sleek and elegant as well. The periphery line, which is made of anodized aluminum, runs along the phone edges and creates a slim and elegantly curved profile. Those numbers in combination with the materials used and the lightweight of 111.5 grams guarantee comfortable grip even when typing. The beautiful sleek cover of the Galaxy S 3 Mini accommodates a 4’’ Super AMOLED capacitive touch screen with 480×800 pixel resolution. The display offers a very good pixel density 233 points per inch and the picture becomes even clearer and detailed with the 16M colors on the display. You also won’t experience any difficulties using it outdoors even under direct sunlight. The sensor performance on the screen is also excellent you easily zoom in and out while browsing and also navigate through many pages. Below you will find the physical home button and the two ambient-light touch-sensitive buttons. On the opposite corner the phone features a video-call VGA camera. The 5MP base camera takes a middle position on the back lid of the headset. Its resolution is 2592×1944 pixels and features touch focusing, face detection and the gps function geotagging. The LED flash is what allows you to take a clear picture in the dark as the light reaches up to 3 meters. It can also be activated in video recording mode which captures in HD at 30fps. The sound comes from a single speaker placed on the left side of the base camera, it is loud and the sound quality is good. The chassis is simple and clean on the right edge you will find the power button, on the upper a 3.5 mm audio output and on the left edge – a two-sided volume controller. A microUSB port that also serves as a charging port can be found on the down border. The model features also the more and more commonly used NFC connection technology. Galaxy S 3 Mini performs excellent thanks to the hardware fill – the dual-core NovaThor U8420 chipset runs at 1GHz frequency. The hardware responsible for the good graphics is Adreno 205. The operating RAM is 1 GB and for the memory storage you can choose between 8 and 16GB. However if you need more space to store your contacts messages and pictures, there is a micro SD card slot available for expanding the capacity with up to 32GB more.The Samsung Galaxy S3 mini has an impressively rich interface as the Android Jelly Bean platform offers the flexibility to run and access many applications and widgets at the same time. The latest Android operating system and the Li-On 1500mAh battery provide around 6 hours of intensive work and talk. I am going to need some feedback from you guys, if you enjoyed watching this review, it was helpful to you or you want to share your thoughts with us use the comment section just below the article I will be waiting.